It was about a year ago that our CEO took a look at our office space and realized we needed a change. While we sat in a collaborative, open environment, the design of the space was dull and much too small for the rate that we were growing. After many floor plan drawings and probably too many Pinterest boards, we finally have the pleasure of introducing you to our new space! This is a place for our employees to collaborate, grow, and flourish (and of course play some ping pong). However, this is more than just a workspace. It is a story of how we as a company, understood our need to grow. Once we knew we needed to move into a new office, we truly wanted to find a space that we could make our own. We did some searching, took tours of some potential locations, and finally settled on an unfinished section of the current building we were in. When we first viewed the space, it was a mess – the floors were concrete, the old school tile ceiling was in the midst of being torn down, it was not a workable space. However, we had a vision. Behold – our office build-out begins! Do you know what your preferred workspace is? For example, do you prefer to work at a desk? Or to stand? Or do you feel the most productive when you sit on a couch or a bean bag? These were the types of things we considered when we designed the different spaces in the office. We also wanted to create dimension by offering workspace options that vary in heights, such as high top tables and low beanbag chairs. This is a central point to our space, and also the place that we do all of our eating (almost equally as important as our work). You can stand or sit at the high top table, and also jot down your creative thoughts on the kitchen white board. When it comes time to hold a quick meeting, we will often opt to gather in the kitchen so we can all sit together in one space to brainstorm. This area represents the “chill” vibes in the office. Equipped with two beanbags, a couch, and a TV, we often choose to work from this area after a big lunch (can you tell we love eating? ), or if there is some sort of sports competition on TV. The TV also allows us to watch webinars or share our projects with the team while being in a comfortable setting. Sometimes if we are feeling a lack of creativity, the fun of sitting in the beanbags helps to spark new ideas. Our most traditional space would be our office conference room. It's perfect for weekly recap meetings, or for those who need to sit in a quiet space. This is where you can find our team every Monday morning as we go over our goals and projects for the week. This space helps us to fully collaborate as a team and allows us to refocus after the weekend is over. We also gather here when we join in on webinars with our whole team and can’t all fit in beanbags around the lounge TV. 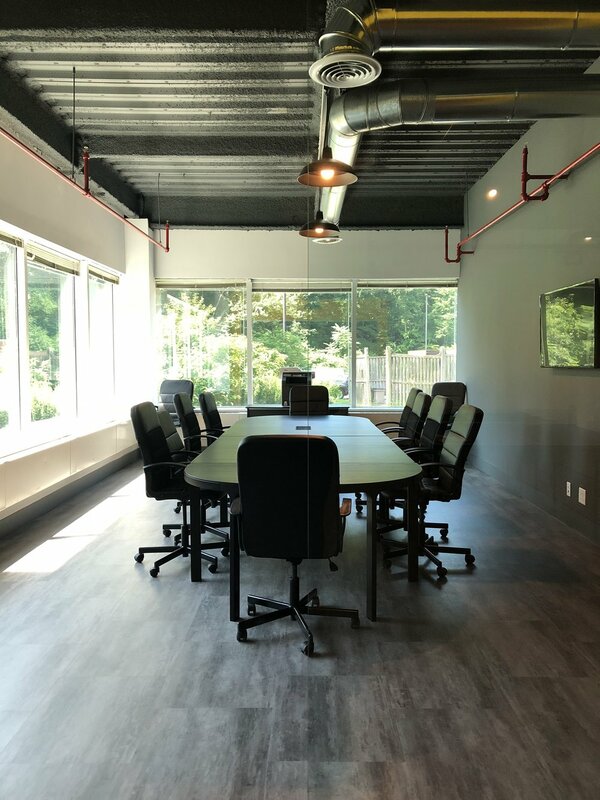 If you need somewhere to sit alone and get your work done with no distractions, you would probably enjoy the quietness of the conference room as well. If you happen to be more productive in your own personal space, we have our workspace area where we get to put ourselves in our own little bubbles and check things off of our to-do lists. Having our own desk space to put things like plants, photos of dogs and extra sweatshirts when it’s chilly helps us stay independent and organized. When designing the space, we also kept in mind that these groups of desks should be specific to the department of the business such as sales and support, marketing, and social media. We chose to group together the sales and customer support associates in one area of the office and separate them from the marketing associates. This was a decision that influenced the layout of our space as well. Overall, our office build out was an exciting project that spanned over the course of the last year. We spent countless hours carefully selecting furniture, snacks for the kitchen, and made collaborative workspaces a priority. We now have communal spaces for meetings, brainstorms and our weekly happy hour! Where do you feel the most productive? Comment below and let us know!